In-line and batch cleaning system to match your needs. No matter what the cleaning requirement or challenge may be, please contact our experts to discuss a complete and effective solution. Direct dynamic jet technology delivers maximum energy for unsurpassed cleaning capability. Electrovert’s mixed spray technologies can be customized for any cleaning application. The Aquastorm series cleaners are compatible for any aqueous and semi-aqueous based chemistry cleaning process. Centrifugal energy, produced when parts are rotated inside a sealed process chamber, provides thorough penetration, solubilization, and contaminant removal when coupled with cleaning chemistries. 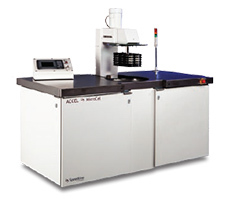 Products cleaned in the MicroCel are held in place and secured to the robot head using either universal adjustable fixtures, standard magazines/ carriers, or custom fixtures specific to the product type.